When the Exxon Valdez accident happened twenty-six years ago this week, Alaskans learned first-hand what a massive oil spill can do to a community. What if a similar tragedy happened in BC? We’ve heard the repeated warnings from federal and provincial assessments that we don’t have the resources to respond to a major oil spill, and we know that the risks are increasing with proposals like Kinder Morgan’s pipeline expansion on the table. At Georgia Strait Alliance, we’re focused on how the risks could affect communities in our region, and what local authorities are doing to be prepared. As part of our research as official intervenors in the National Energy Board review of Kinder Morgan’s proposal, we have been investigating marine oil spill preparedness and response capability in coastal municipalities in the Georgia Strait region. We are becoming increasingly concerned that local governments have not been sufficiently included in oil spill planning and risk assessment; and, in the event of an accident, are likely to be involved in the response effort without adequate resources, training or planning. We started reaching out to emergency management staff in some key councils, who expressed similar concerns. We are very excited to share that today, the City of Vancouver unanimously passed a motion calling for additional resources and capacity-building for local governments to strengthen their oil spill preparedness. Vancouver has agreed to forward the motion to the Lower Mainland Local Government Association, and then hopefully on to the Union of BC Municipalities convention in the fall. We’re proud to have worked with city staff to get the resolution this far, and grateful to Vancouver for its leadership on this issue, which will benefit communities across the province. What roles do municipalities play in the event of a spill? What are municipalities doing to prepare for a spill, and is this adequate? What can we learn about the realities of, and best practices for, local involvement in a spill from municipalities who have been through one? What unique contributions can municipalities make to the preparedness and response efforts led by other agencies, and do they have the resources to participate in these initiatives? 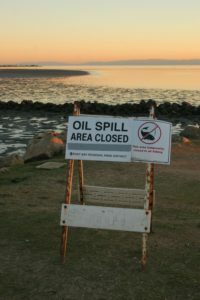 Ultimately, are coastal communities in the Georgia Strait ready if an oil spill happens? By now, those of you who follow this issue closely might be wondering… aren’t marine oil spills a federal responsibility? Won’t clean-up be handled by the Coast Guard, or a response contractor hired by the ship- owner? And technically, you would be exactly right. But from talking to local government staff and councillors who have experienced a spill, if oil is washing up on local beaches, municipalities inevitably get involved. The reality is, emergency services get called out. Volunteers want to know how they can help. Beaches, roads and other infrastructure may need to be closed. And that’s just once a spill has happened. Imagine the contributions communities have to offer – for example, local knowledge of sensitive areas that should be protected first, or resources that could be made available – if they had the time and resources to take part in advance planning processes. These are realities that need to be taken seriously – by municipalities across the province, by senior levels of government, by citizens, and by the National Energy Board. In the coming months, you’ll hear a lot more from us about this issue. We’ll be publishing the results of our research, and offering to present it to councils throughout the Georgia Strait region. We’ll be asking for their involvement – and yours – to help get the City of Vancouver motion passed at higher levels, and get the issue on the agenda of the provincial and federal government. Together, we can ensure that local governments are in the best possible position to protect their community and environment if the oil spill we all fear should happen in our region.